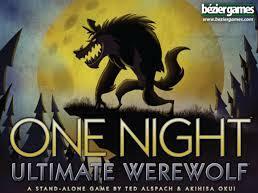 One Night Ultimate Werewolf is a fast game for 3-10 players where everyone gets a role: One of the dastardly Werewolves, the tricky Troublemaker, the helpful Seer or one of a dozen different characters, each with a special ability. In the course of a single morning, your village will decide who is a werewolf... because all it takes is lynching one werewolf to win! Because it`s so fast, fun, and engaging, you`ll want to play it again and again, and no two games are ever the same.